If you've ever seen one of my library reading programs, you know that I push reading as one of the ways to change your life. I don't just talk the talk, I am a very avid reader, consuming 60-90 printed books each year, several hundred hours of audio books, and subscriptions to almost 20 magazines. I'm also pretty fickle about what gets to stay in my library. There are books that I start but never finish because they are too boring or overly simplistic. There are books that I read and enjoy, but know that I will never read again, nor will I ever recommend them to anyone else. These books don't make it into my library. When I'm finished with these books, I pass them on, usually to my local library as a donation. But about 60-70% of the books I buy each year get to stick around in my personal collection. It actually spans several rooms. I keep 2-3 books in my car at all times. I try to arrive at all my assembly programs at least an hour early and this usually results in time that can be spent reading. If I'm ever found waiting (to get my oil changed for example) I know I have a choice of reading materials. If the weather is foul and I can't ride my bike the 5 miles to the gym in the morning then I will drive. This way I get to read while I ride a stationary bike at the gym. I will admit to having been so engrossed in a book that I drove to the gym just to ride the stationary bike so that I could read and ride at the same time. I do not apologize. I'm also usually reading 2-3 different books that I keep by my bedside. I read for 30-60 minutes before going to sleep each night, although I have gone to bed too tired to read on more than one occasion. As you might imagine, I have a pretty large personal library. We've dedicated an entire room in our home as a library. It didn't come with built-in bookshelves, so we had them installed. 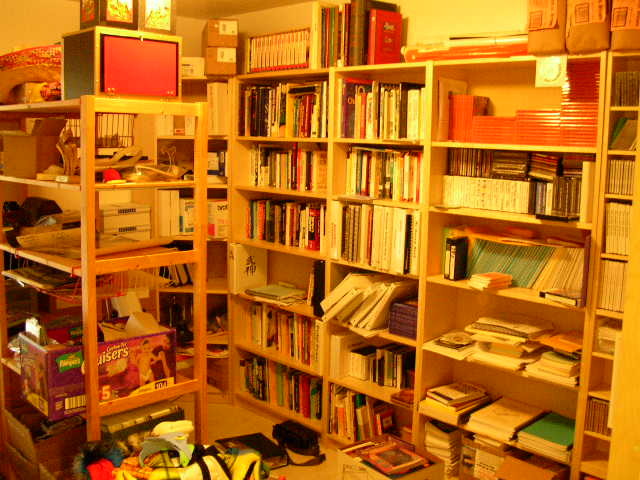 We also have bookshelves in almost every room of our house. The guest room (hardly usable from all the stuff being stored there) has more books than most people probably own, but our library is really my little nirvana. We have floor to ceiling bookshelves on almost every wall in the room. The closet is set up as my writing area (I'll post on that later) and we still didn't have enough room for everything so we bought a shelving unit that sticks out into the middle of the room from one wall.